Yesterday I launched comic.browserling.com - a new webdev jokes cartoon series. I started with 3 cartoons (restaurant, comic sans, grandma) and just now I added a new cartoon. All cartoons are licensed under the CC BY-NC license. You can share, remix, transform, copy, link to, redistribute cartoons and jokes but you can't sell them. If you like these cartoons, please subscribe to updates and follow me and @browserling on Twitter! 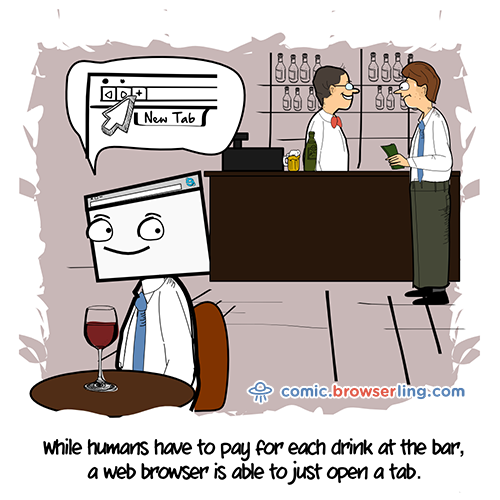 This blog post is a repost of A new webdev cartoon: Bar on Browserling's cross-browser testing blog.